"If you need orthopedic care go to Dr Raffo!" "He is amazing. And the staff is caring and professional. I highly recommend." "I am already driving and doing everything by myself, he was wonderful and caring." "Very impressed with Dr. Raffo and his customer service." "Dr. Raffo was very knowledgeable and informative." "Dr. Raffo is a excellent doctor, and I would recommend him 100%." "We love this practice! Thank you for the excellent service and treatment!" "Very friendly staff all around. My questions were answered." "Dr. Fitzgibbons is the doctor to go if you have hand or elbow problems." "He listens well and seems to ask all the right questions." "Dr. Fitzgibbons is an amazing surgeon. I had surgery several weeks ago on my elbow." Our team of skilled orthopedists at The Centers for Advanced Orthopaedics: Maryland Orthopedic Specialists Division treat patients of all ages with any bone or soft tissue ailment. With two locations conveniently located in Bethesda and Germantown, Maryland, we welcome new patients from throughout the greater Washington, DC area. Our team of experts specialize in sports medicine, hand and upper extremity surgery, podiatry, joint replacement, and physical therapy. With over 40 years of combined experience, our orthopedic practitioners treat acute injuries such as fractures and ligament tears as well arthritis and other chronic problems. Patients can feel confident that they’re getting the latest in advanced care from our three, board-certified, fellow-ship trained sub-specialist surgeons. We pride ourselves on expert care provided in a friendly, patient-focused environment. Our physicians work closely with in-house physical therapists to employ modern rehab techniques. If a patient needs surgical intervention, the orthopedists use the most minimally invasive, joint-preserving techniques available. Because the team focuses on advanced pain management and rehab, patients can expect to return to work, school, and even sports activities rapidly, with minimal discomfort. The clinic’s specialized athletic trainers and physical therapists work to ensure that each patient regains motion and strength while minimizing their risk of re-injury. 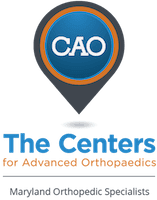 The mission of The Centers for Advanced Orthopaedics: Maryland Orthopedic Specialists Division is to provide the highest quality orthopedic care possible in an efficient, comfortable manner. With a customer service-oriented team, electronic health records, and online appointment booking, we strive to make all aspects of your recovery as smooth as possible. At Maryland Orthopedic Specialists, we accept most major insurance plans. Here is a list of some of the plans we accept. Please contact our office if you do not see your insurance provider listed.